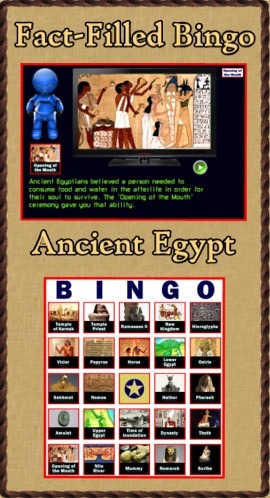 Are you looking for a way to add interest to your Ancient Egypt unit? Do you need more activities for your learning stations? 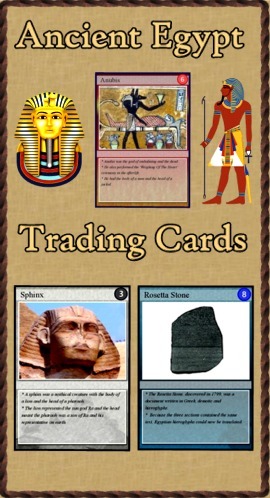 “Ancient Egypt Trading Cards” is a set of 54 trading cards highlighting famous persons, places, events and documents of Ancient Egypt. Print and laminate the cards to create a standard set of playing cards. "Educational Trading Card Games" details three original learning games. 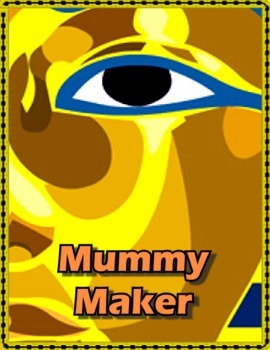 Creating Educational Trading Cards shows teachers and students how to make their own cards. These are fantastic - was planning on making my own but yours are wonderful! Great as a quick snap of each aspect of Ancient Egypt - I plan on using them to distribute to students and have them complete a research project on their given topic to become an 'expert' and teach the rest of the class about it. Thank you! Wonderful trading cards! I have been collecting the ones you sell as they work so well! My students really enjoyed this activity! Thank you! Enter the embalmer's workshop, where you are to prepare the body of Ramose, officer to the king, for burial.The chief embalmer, Kha, will be watching your work closely. Complete your task perfectly, or he will be denied paradise. I am really looking forward to using this in my 6th grade history class! Great looking product!